This week I have been working on a monster of a project. While I won’t exactly reveal what I’m working on, I will show you what I’m working with…. sheets. 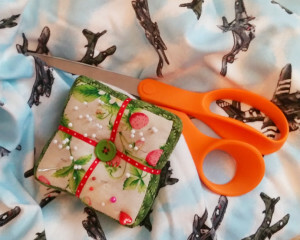 This seemed like a brilliant idea at the time – it’s a great upcycle project, it’s in ‘fabric’ that you can’t buy anywhere else, there’s plenty of yardage, and the top and fitted sheet are two different themes giving me plenty of design options…. so I thought. One thing I’ve noticed about kids sheets are that they are extremely thin. I didn’t think this would pose an issue, but it is so thin that the fabric had a tendency to almost stretch out of shape (it doesn’t really help that some areas are off-grain in their printing) so extra interfacing was definitely necessary. The other obstacle are the prints themselves – they are so large that fussy cutting was more difficult that I anticipated. In fact, it was so difficult, I spent an entire day cutting out the fabric alone (never mind all the interfacings, etc.)! The end result should be worth it though – I’m anxious to see this come together, it should be fun if it turns out like I envision! This entry was posted in Uncategorized on May 29, 2015 by stacy. Keep warm on chilly summer evenings with a summer knit cardigan. Love quilting? Check out this great giveaway for a Wish Table and so much more! Replace that body pillow with a cool, snugly 8-foot giant squid. Keep the sun out of your eyes this summer with a unisex visor that can match your wardrobe! Your next picnic doesn’t need to be spoiled by flying insects. Cover your bowls with these food covers. Speaking of picnics, check out this cute blanket – it’s almost too adorable to lay on the ground! A cute take on a simple circle skirt: Make it in tulle. Looking for something more casual? 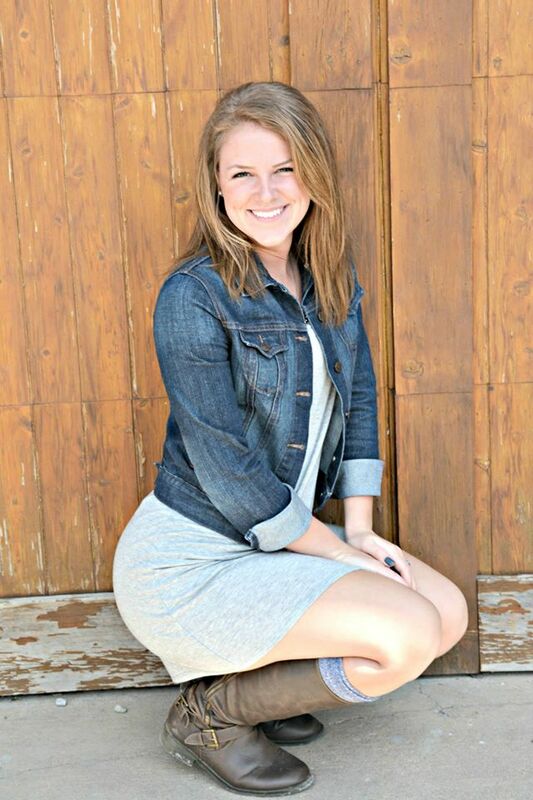 Then check out the Flirty Skirt. Great for summer travels and lazy days at the beach: a pretty tablet cover with a zippered pocket that’s great for headphone and charger storage. My favorite types of sewing books have projects and patterns inside and this give away for Simply Sewn looks like it’s a fun one to own. And we all thought fanny packs were out of style. Here’s another take called the mini waist pack. A perfect duvet cover for a little girl’s room (I’m just not sure that I’d want to work with all those ruffles). Every little girl with want this Everyday Boho dress because pompom fringe is awesome (which is why I secretly want to sew up these Coachella Shorts). This entry was posted in Uncategorized on May 28, 2015 by stacy. One more graduation party means one more Personalized Name pillow hot off the sewing machine! 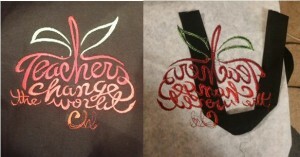 This is the same color scheme as the other two I made over the weekend, but looks a lot different. This, by far, is the shortest name with the skinniest letters that I have ever made – it looked sort of puny after I had appliqued all the lettering. Consequently, I widened the background fabric quite a bit and squared this pillow off which gives it a totally different look and feel from the others. I think if I have this issue again, I may add some sort of applique design (flowers, dinosaur, etc.) to keep it elongated since I like that shape a bit better for this finished pillow. This entry was posted in Uncategorized on May 27, 2015 by stacy. 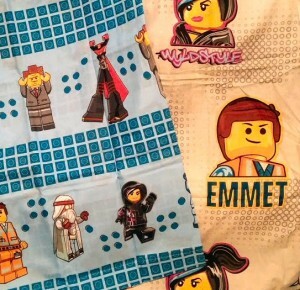 You see, I decided to make Easton’s teacher a new bag to carry on field trips etc. I had thought using a purchased bag would be quicker than starting from scratch. My first stumbling block was the size of the embroidery vs the front of the bag. While the bag was large enough to support the design, the bag had to be split open so that it could be hooped and the extra fabric would stay free of the stitching (so I still needed to do some sewing after all). Everything seemed to be going swimmingly, until I realized….. I didn’t clear the handles away from bottom of the hoop when I started the design! With over half the embroidery already stitched out I decided that I just needed to scrap this project all together and wound up making her a Dimensional Magic necklace instead. That’s what I get for trying to rush a project and finish it last minute! This entry was posted in Uncategorized on May 26, 2015 by stacy. The long, 3-day, (very) rainy weekend means one thing – lots of time in the sewing room! Instead of whipping up some selfish projects, I’m stitching up a few graduation gifts for some of Taylor’s friends. This weekend it’s two Personalized Name Pillows. 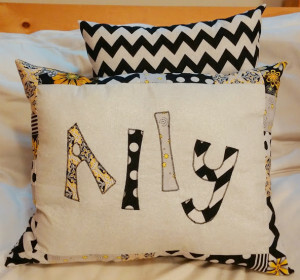 Both girls will be attending Wichita State (hence the black, white, and gold colors) next year and plan on rooming together in the dorms so I made them matching pillows and an extra decorator one that coordinate with each other. I have one more to make and Taylor has asked that I do it in similar colors since she’ll be attending WSU as well. Cross your fingers I have enough scraps to pull one more off! This entry was posted in Uncategorized on May 25, 2015 by stacy. It’s hard to believe, but summer has officially started… and what a better way to end the school year than by wearing a new, handmade shirt! I put the finishing touches on the Perfect Polo just in time for Easton’s last day of school and have to admit, it may be one of my favorite pieces that I’ve made for him this year (or at least it’s tied with the Bookworm Button Up that I made at the beginning of the school year – which is also another Blank Slate pattern). For this project, I used a Vintage Bomber Print for the main body of the shirt (and pocket) and a black cotton knit for the contrasting areas (collar, placket, sleeves, and saddle shoulders). 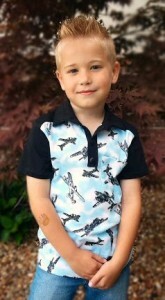 The end result turned out to be a fun, novelty print shirt, but not too juvenile for a future 2nd grader. 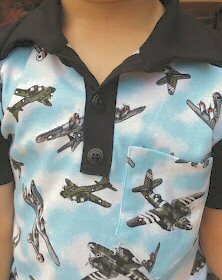 As for sewing, this shirt went together incredibly well. In fact, the placket on this version may be one of the nicest that I’ve ever made (and the pocket isn’t too shabby either, just check out those crisp points). The collar, which is noted as being one of the more difficult parts to put together, was even sewn perfectly the first time! I should probably add that I did use a bit of interfacing here so that the collar had some shape and that I skipped hand stitching the collar to the inside of the shirt (because I really, really dislike hand sewing and try to avoid it as much as possible). Instead, I pinned the underside of the collar in place and stitched in the ditch on the outside of the shirt. And the fit? I think it’s spot on! But the most important thing is that Easton loved it. I have a feeling that I’m going to be making more of these before the start of the next school year. 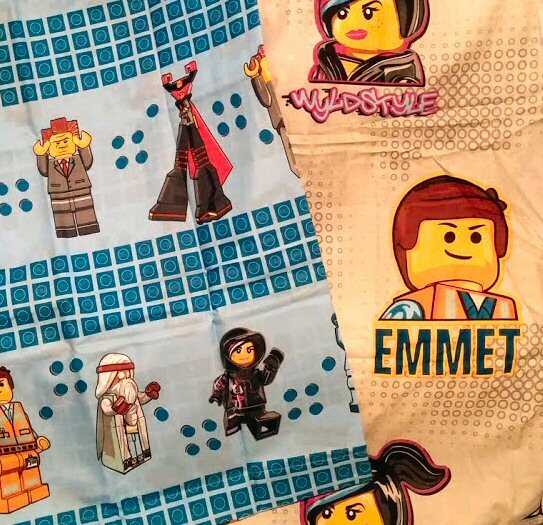 Hmmmm, I did just get that Minecraft fabric….. Final Thoughts: I normally don’t sew a lot of soft-collared shirts because I always think it will take a longer time that what I have to sew, but this one was a breeze! From start to finish, I was able to stitch my shirt in a day and the end results look better than what I’ve been buying in the store. The Perfect Polo is great ‘wardrobe builder’ for any little boy (or girl), but is definitely geared toward for at least intermediate sewers. 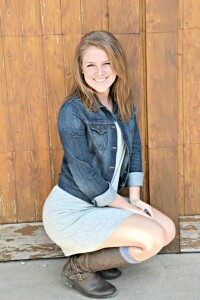 I received the Perfect Polo pattern for free in exchange for this blog post. The above entry is an honest review of the pattern, but keep in mind it is my opinion. Just with any pattern, your results, fit, and experience may vary from mine. This entry was posted in Uncategorized on May 21, 2015 by stacy. Everyone could use more fabric – especially when it’s FREE! 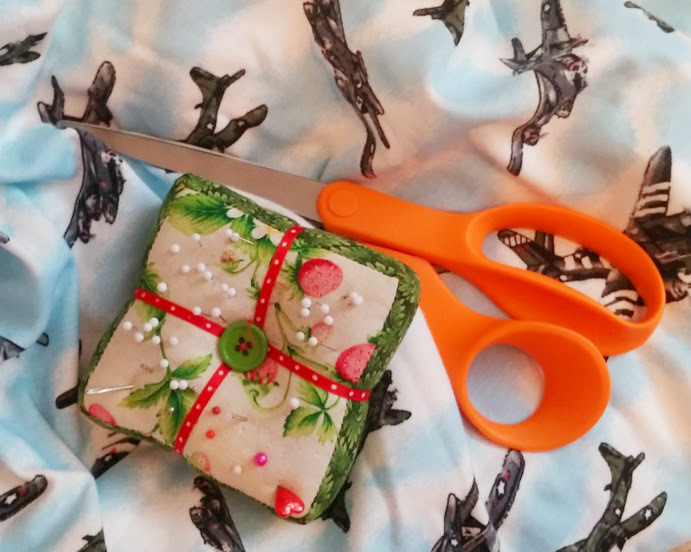 Enter to win a Gypsy Lane Fat Quarter Bundle here. Dad can officially skip the diaper bag when you give him this great grab-and-go style diaper clutch. Love the look of sparkle vinyl but never know what to do with it? This Retro Diner Bucket Bag is a fabulous way to try out this material and get lots of complements on your finished purse! Perfect for Memorial Day parties, bridal showers, or just because: Pretty Casserole Carriers! Learn how to stitch up cute Mommy-and-me matching tote bags – perfect for the beach or pool. “Fancy” zippers are everywhere now which means you don’t have to hide them in between layers of fabric any more. Show off your gorgeous zipper with this Exposed Lace Zipper Pouch tutorial. Decorating your room a nautical theme? Then you’ll definitely want to sew up one of these ‘sailor’s knot’ style pillows. The last day of school is drawing near. Give your favorite teacher something totally unique – an Apple Plush Pillow. Skip the pants this summer and go for comfy dresses instead. This Dolman Dress is a perfect place to start. You don’t have to sacrifice style when you want to be comfortable. This pretty kimono definitely is both! Sewing your own underwear is easier than you think and is a great way to use up scraps that are too small for garment sewing. Try them out for yourself with this boxer brief pattern. 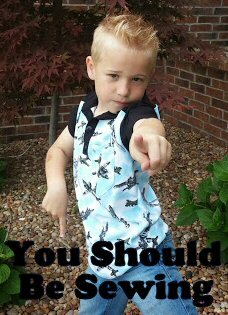 Wanting to get your child to read a bit more this summer? Stitch them up a Pocket Pillow and stuff with their favorite titles. This pretty leather tote is large enough for you laptop and is made in just 4 simple steps! Looking for leather, but a bit more detailed? This tote from Boxwood Avenue takes a bit more time, but has fabulous end results (plus there’s a good tutorial on making your own tassel). Skip the boring clay pots and go with this totally unique fabric bin planters. You know what feels good? Getting back into the sewing room after (what feels like) a long hiatus! Yesterday was incredibly productive: I printed off the Perfect Polo, taped it together (alright, there really wasn’t much taping to do – just 4 pieces), trim it to size, cut into the fabric, and made the nicest placket and pocket that I may have ever sewn (and even though you can’t see the buttonholes in the photo, I think they look pretty great too). Overall, I’m really excited about the way this shirt is taking shape! This entry was posted in Uncategorized on May 20, 2015 by stacy. There may have been a bit of ‘radio silence’ the other day, but that’s because… we have a new graduate in the house! The past few days have been filled with parties, preparations, and the actual ceremony (last night) – whew! I’m spent. Besides feeling like I need to sleep for the rest of the week, I can’t wait to head back into the sewing room – I have lots (and lots) of projects I’ve been daydreaming about. 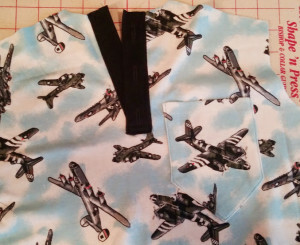 The first project I’m making this week is Blank Slate’s Perfect Polo… and I’m finally cutting into the fabulous vintage bomber fabric that I picked up awhile ago from The Fabric Fairy. From the looks of this pattern, it should be a fun, easy sew – just the thing to get back into the swing of sewing after a week or so off…. I may even have it finished in time for Easton’s last day of school Thursday! This entry was posted in Uncategorized on May 19, 2015 by stacy. 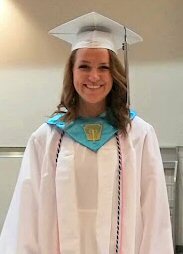 It’s hard to believe, but in just 4 days, Taylor will be graduating high school. Where did the time go? Much of this week has been spent cleaning (it took me almost an entire day to organize my sewing room – it was a disaster), getting party ‘stuff’ together, and making a few items for her open house. What kind of items you ask? 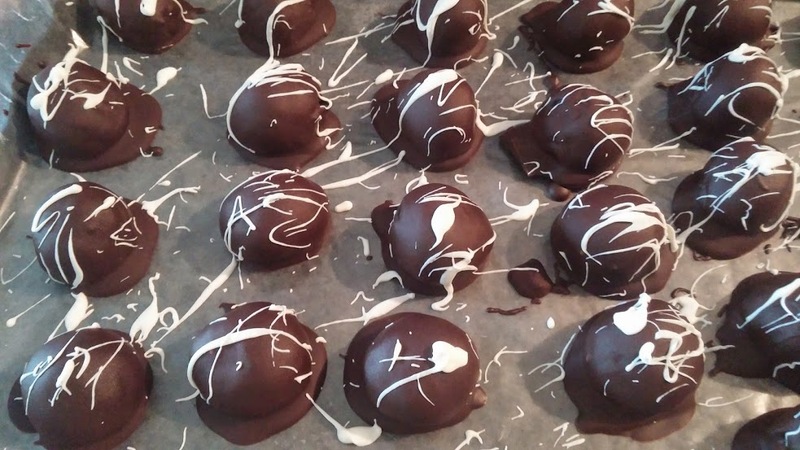 Delicious cookie and cake balls\truffles! I don’t do a ton of baking (because who needs that much sweets in the house all the time? ), but I really enjoy it when I do. This time around, I whipped up the ever popular Oreo Cookie Balls and a new-to-me recipe, Cake Batter Truffles. I’m not going to lie, the Cake Batter Truffles are the bomb – they put the Oreo Cookie Balls to shame. (The photo below is the cookie balls – I forgot to snap a photo of the cake balls before I packed them away for storage). I did make a few changes to the cake batter truffles though: I omitted the sprinkles on the inside of the dough, I used Wilton Candy melts for the coating (because there will be so much chocolate already on the dessert table, I thought an alternative would be good), and omitted the nonpareils on the outside of the truffles (I used colored sugar instead)…. those little candy beads are way too crunchy for my taste. This entry was posted in Uncategorized on May 15, 2015 by stacy.